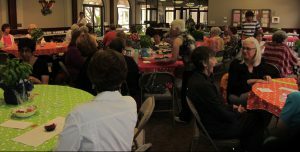 Annual Potluck Luncheon Returns on July 10! Join us for a summer potluck luncheon at our monthly meeting on July 10. The potluck is a relaxing time to enjoy food, knitting and friendship with new and old Guild members. Our meeting in July is on the second Tuesday of the month. Please bring a potluck dish to share. Choose your favorite appetizer, side dish, entrée, dessert, or drink. Sign-up sheets will be available at the June meeting if you would like to commit to a dish in advance. For more information, or to volunteer to help, contact Potluck Coordinator Tree Dezazzo at potluck@sandiegoknitters.com. For fun, this will be a Frog, Finish, or Fix event. If you have projects that have been sitting unfinished, bring them to the July meeting and get the satisfaction of Guild member support as you frog (i.e., rip out the work), finish, or fix them. If you are unsure what to do with a UFO (unfinished object), the potluck is the perfect time to crowdsource an answer! As always, bring your knitting. Save your Show and Share items until the next meeting in August. Doors open at 12:45 pm and lunch begins at 1:15 pm.